Strangely enough, all my family’s Christmas food traditions are Christmas Eve based. I’m from San Francisco originally and Christmas Eve always meant cold Dungeness crab and french onion soup. Christmas Eve was always the best because we would sit around with our next door neighbors and sing carols and eat treats all afternoon. Our neighbors were British and they’d always bring over sausage rolls. I still make them from my neighbor’s recipe, which involves boxed pie crust mix. I suppose some day I ought to make a proper crust for them, but nostalgia holds me back. Christmas Day was always kind of hodge podgey though. My whole extended family lives in the San Francisco Bay Area and we would often visit multiple relatives up and down the Peninsula, even into the City and the East Bay. So as an adult, I’ve developed my own Christmas food traditions. 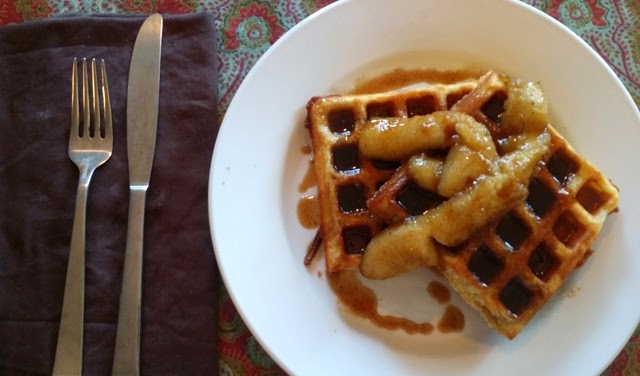 The most important one and the one I do every year because it’s the sort of thing that one really oughtn’t eat all the time is Bananas Foster Waffles. 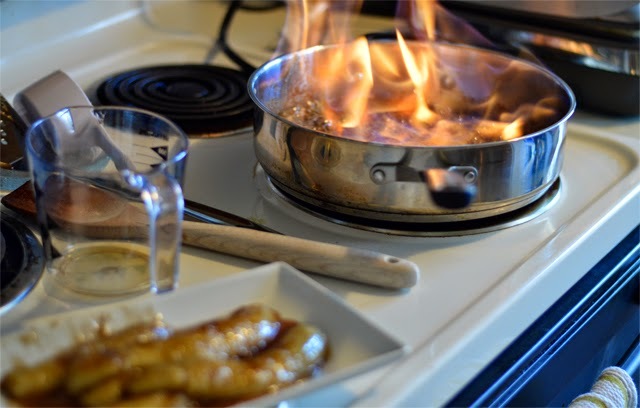 It’s a pretty basic bananas foster recipe based on this one by Alton Brown, but banana liqueur tastes awful, orange zest is overkill and the recipe doesn’t generate quite enough sauce for waffles so I’ve amended it over the years. 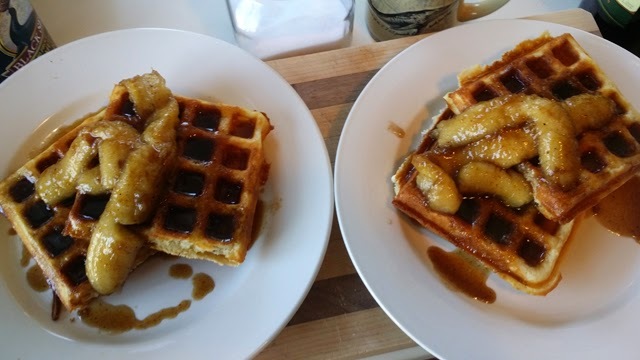 I usually make the waffles and sauce at the same time, but if this is your first time making bananas foster, I’d cook the waffles before starting the sauce and stash them in a warm oven. If you’re cooking for more than two, double the quantities, but keep the alcohol amount the same since you’re setting it on fire. It will still taste fine. And Merry Christmas from Cooking Up Romance! I hope you and your family and friends find joy in the day. Melt butter in a heavy skillet over low heat. Add brown sugar, allspice, nutmeg and water and stir until sugar dissolves. Bring sauce to simmer. 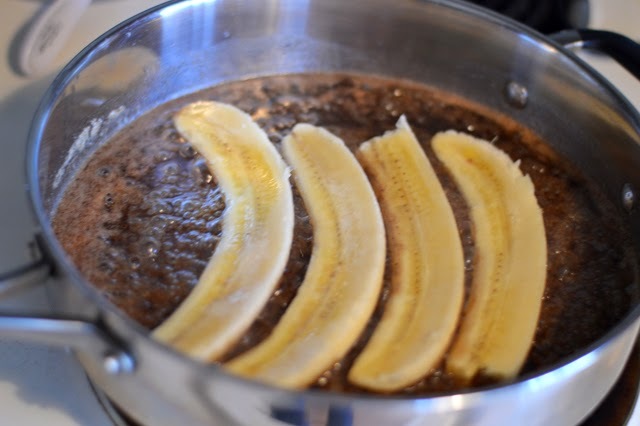 Add bananas and cook for 1 minute on each side. Remove bananas from pan to a serving dish. Bring sauce to a simmer and carefully add the rum. If the sauce is very hot, the alcohol will flame on its own. If not, using stick flame, carefully ignite and continue cooking until flame dies out, approximately 1 to 2 minutes. If sauce is too thin, cook for 1 to 2 minutes until it is syrupy in consistency. Immediately spoon the sauce over bananas and serve. Serve with waffles.